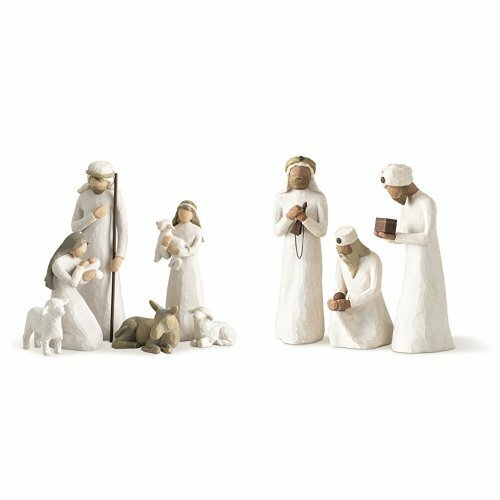 Willow Tree Nativity, 6-piece set of figures by Susan Lordi 26005 & Demdaco Willow Tree 8.5-inches The Three Wisemen for the Nativity, Resin metal by at Rossetti Productions. Hurry! Limited time offer. Offer valid only while supplies last. Sentiment on enclosure card: "Behold the awe and wonder of the Christmas Story". Enclosure card included in box for gift-giving. Six hand-painted resin figures, tallest is 9.5"h. Includes Mary, Joseph, shepherd, donkey and two sheep. Dust with soft cloth or soft brush. Avoid water or cleaning solvents.